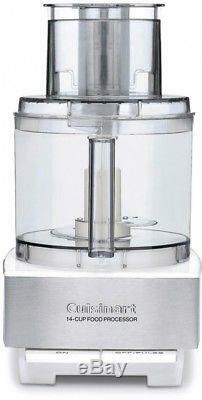 Cuisinart Custom 14-Cup Food Processor in Brushed Stainless Steel and white. 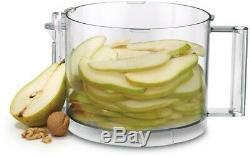 This large capacity food processor speeds up all cooking from quick, weeknight meals to weekend celebrations. With the large 14-cup work bowl, extra-large feed tube and dishwasher-safe parts, there is more time to share the delicious results with family and friends. It is a beautiful addition to any kitchen. Brushed stainless steel and white. Powerful enough to knead bread dough with ease. Stainless steel medium slicing disc (4mm). Stainless steel shredding slicing disc. Easy to use and clean. : 11.00 in Product Height in. : 14.80 in Product Width in. : 7.90 in Appliance Type: Processor Blade Material: Stainless Steel Color/Finish: brushed stainless and white Color/Finish Family: White Detachable Spindle: Yes Dishwasher Safe Parts: Yes Features: Full-Size Feed Tube, Locking Lid, Pulse Control Full-Size Feed Tube: Yes Locking Lid: Yes Product Weight lb. 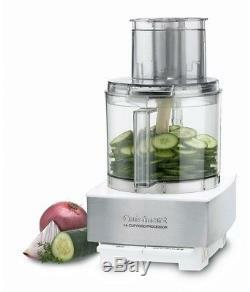 : 16.00 lb Pulse Control: Yes Returnable: 60-Day Small Electric Product Type: Food Processor Style: Farmhouse, Transitional Touchpad Controls: No Wattage (watts): 720 W Weighted Base: Yes Work Bowl Material: Plastic Certifications and Listings: 1-UL Listed. The item "Cuisinart Food Processor Custom 14-Cup Brushed Stainless Steel White New" is in sale since Saturday, November 24, 2018. 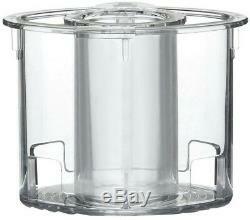 This item is in the category "Home & Garden\Kitchen, Dining & Bar\Small Kitchen Appliances\Food Processors". The seller is "onlinehomeimprovementdeals" and is located in Phoenix, Arizona. This item can be shipped to United States, Canada, United Kingdom, Denmark, Romania, Slovakia, Bulgaria, Czech republic, Finland, Hungary, Latvia, Lithuania, Malta, Estonia, Australia, Greece, Portugal, Cyprus, Slovenia, Japan, China, Sweden, South Korea, Indonesia, Taiwan, South africa, Thailand, Belgium, France, Hong Kong, Ireland, Netherlands, Poland, Spain, Italy, Germany, Austria, Bahamas, Israel, Mexico, New Zealand, Philippines, Singapore, Switzerland, Norway, Saudi arabia, Ukraine, United arab emirates, Qatar, Kuwait, Bahrain, Croatia, Malaysia, Brazil, Chile, Colombia, Costa rica, Dominican republic, Panama, Trinidad and tobago, Guatemala, El salvador, Honduras, Jamaica, Viet nam, Uruguay.